Bringing extinct animals back to life is a tantalizing idea for many people. Although there are problems still to be solved, the process is gradually becoming more feasible. Whereas a few years ago scientists thought that recreating extinct species was an impossible task, some are now saying that it may be within the realm of possibility in the not-too-distant future, at least for some species. In fact, some Japanese scientists predict that they will be able to clone a woolly mammoth within five years. How could resurrecting an extinct species that has long disappeared from the earth even be possible? The key is finding the DNA, or deoxyribonucleic acid, of the species. 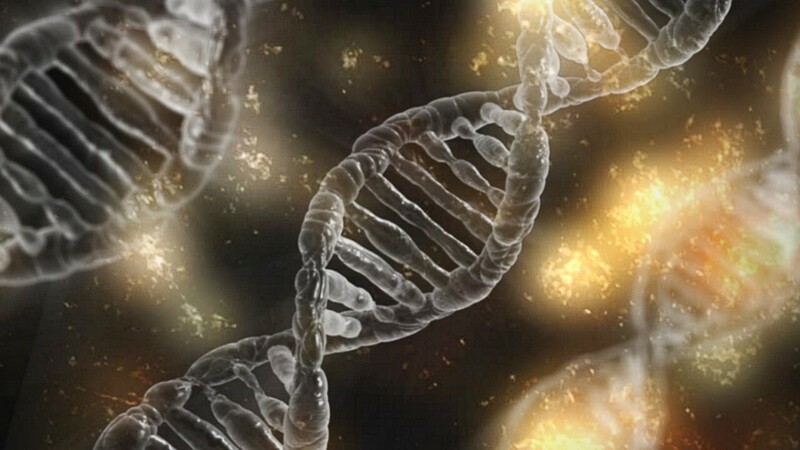 DNA is the molecule that contains the genetic code of an organism. The code is the set of instructions for making the animal's body. Once a sample of an extinct animal's DNA has been found, the next step in the resurrection process is to find an existing animal that has some similarities to the extinct species. The extinct animal's DNA is inserted into an egg of the existing animal and replaces the egg's own DNA. The embryo that develops from the egg is then placed in a surrogate mother to develop. DNA is vital in the life of an organism. The chemical is located in the nucleus of our cells. It not only contains the instructions for making a baby from a fertilized egg but also affects many of our body's characteristics during our life. The chemical is also present in animals, plants, bacteria, and some viruses. Even the viruses without DNA contain a similar chemical called RNA or ribonucleic acid. A lot of research is being done in relation to DNA and its activity, since this molecule is the key to life. The research is helping scientists understand how life works. It's also helping them learn how to manipulate the genes in deoxyribonucleic acid. A gene is a segment of DNA that codes for a particular characteristic of an organism. It's easier to find DNA from recently extinct animals than from animals that died out long ago, since in dead animals the chemical breaks down over time. However, scientists are finding fragments of deoxyribonucleic acid in some ancient animals. These animals died in environments that partially preserved their bodies, such as very cold climates. By combining the DNA fragments with an existing animal's DNA in an egg cell (or by replacing the existing animal's deoxyribonucleic acid if the researchers have the complete genetic code of the donor), scientists may be able to create babies that resemble the extinct animal. In sexually reproducing organisms, the egg contains half of the offspring's DNA and the sperm contains the other half. The sperm inserts its nucleus into the egg. Once the egg nucleus and the sperm nucleus have combined during fertilization, the egg divides and produces an embryo. Cloning is a process in which identical organisms are produced by a non-sexual process. In cloning, the researchers place all of the DNA needed to make the desired organism in an egg, so no sperm is required. The egg is triggered to divide artificially in order to make an embryo. 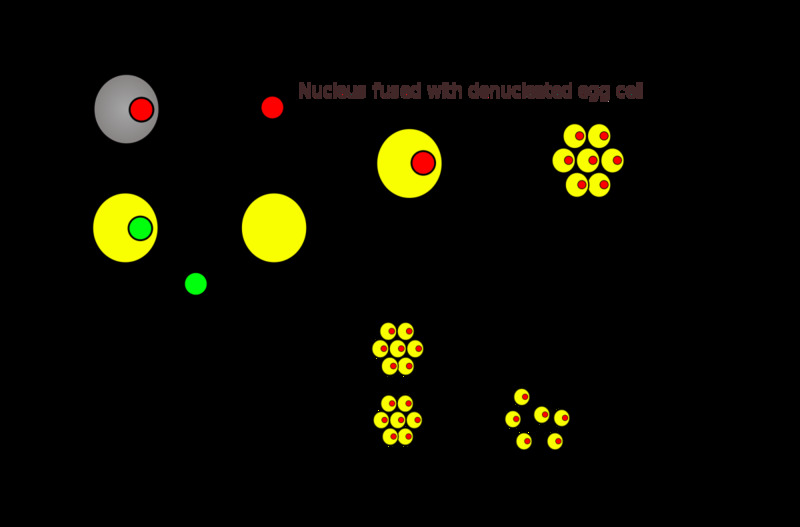 Somatic cell nuclear transfer is a common cloning method. In this process, a nucleus containing DNA is extracted from a cell of the desired animal. This nucleus is then inserted into the egg cell of a related animal, which has had its own nucleus removed. The resulting embryo is placed inside a surrogate mother. The baby that develops is identical to the desired animal, not the surrogate mother, and is said to be a "clone" of the desired animal. Another cloning method is known as synthesis. In this method, a fragment of the desired organism's DNA (or of DNA produced in a lab) is combined with part of another organism's DNA in an egg cell. The offspring therefore has some of the features of the desired organism, but not all of them. This method may be useful when only some of an extinct animal's DNA has been found. 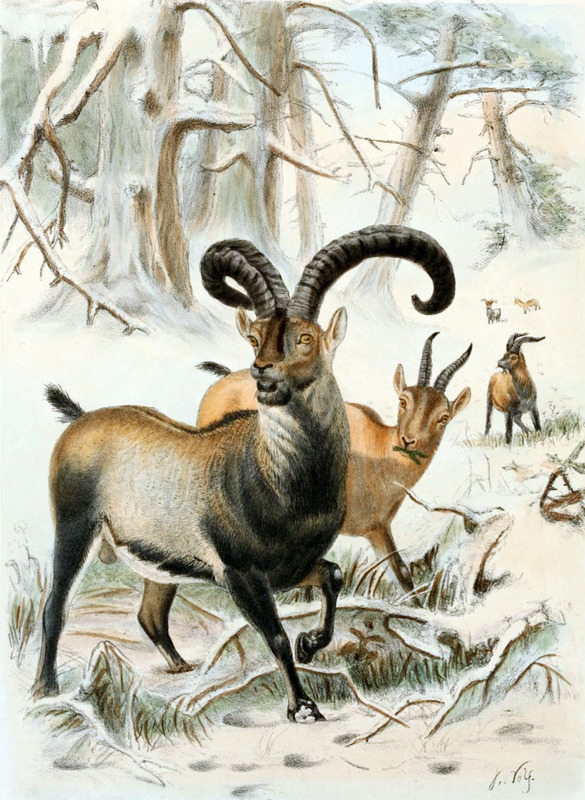 The bucardo was a large mountain ibex that was very well adapted for life in a cold and snowy environment. The last one was named Celia. She died in 2000 after being crushed by a tree. With her death, the bucardo became extinct. However, before Celia's death some of her skin cells were removed and preserved. The nucleus from one of Celia's cells was placed in a goat egg whose nucleus had been removed. This process was repeated, resulting in the production of multiple embryos. 57 embryos were placed in surrogate mothers. Only seven surrogates became pregnant, and only one of these was able to keep the baby alive for the whole length of the gestation period. The successful surrogate was a goat-Spanish ibex hybrid. She gave birth to a clone of Celia. However, the baby had a large, nonfunctional mass attached to the functional part of one of its lungs and was only able to survive for about ten minutes. The attempt to produce Celia's clone was performed over ten years ago. Since then, cloning techniques have improved significantly. The researchers plan to clone Celia again once they have obtained financial support. However, they don't have any DNA from a male bucardo, so they can't produce a mate for Celia's clone. The Lazarus Project in Australia has had partial success in recreating gastric-brooding frogs, which became extinct in 1983. The female of this fascinating species swallowed her fertilized eggs. Her youngsters developed in her stomach. The young froglets were released through their mother's mouth. Scientists collected dead gastric-breeding frogs and kept them in a freezer. In 2013, researchers announced that they had extracted the nucleus from a cell of an animal frozen since the 1970s and implanted it into an egg of a related frog. This procedure was performed multiple times and multiple embryos developed. However, the embryos lived for only a few days. The researchers are continuing their frog cloning attempts. The researchers investigating the resurrection of the gastric-brooding frog may also attempt to clone the Tasmanian tiger, the dodo, and the woolly mammoth. Scientists have not only found the code for making mammoth hemoglobin in a surviving fragment of the animal's DNA but have actually made the blood protein. After identifying the section of mammoth DNA that was responsible for producing hemoglobin, the scientists inserted the section into bacteria. The bacteria followed the "instructions" in the mammoth DNA and made hemoglobin, even though the bacteria don't use the chemical themselves. 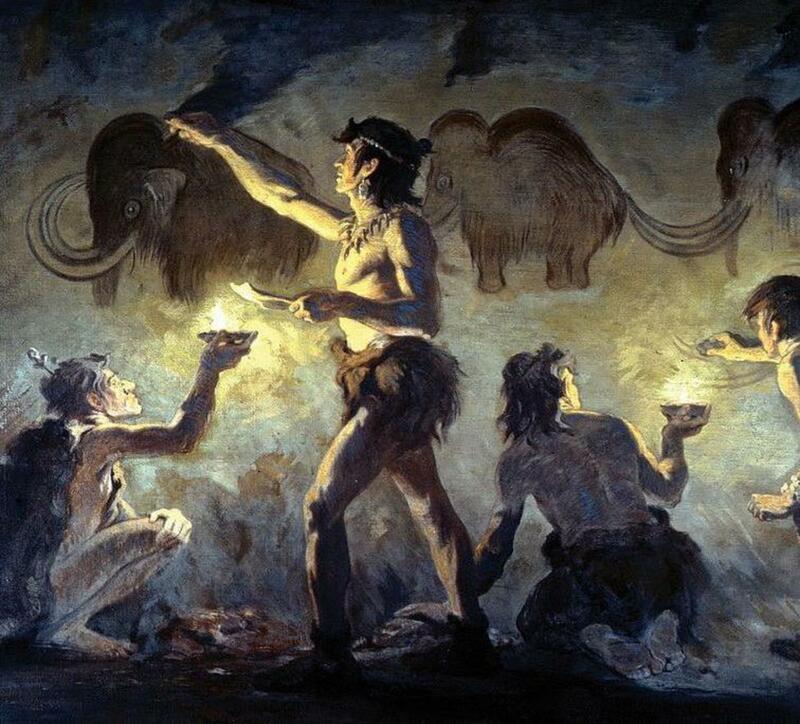 The scientists were then able to compare the properties of mammoth and human hemoglobin. Hemoglobin is found in mammal red blood cells. It picks up oxygen from the lungs and delivers it to the body's cells. The researchers found that mammoth hemoglobin has a much higher affinity for oxygen at low temperatures than the human version of the chemical. This would have been very helpful for mammoths, who lived in cold and icy environments. 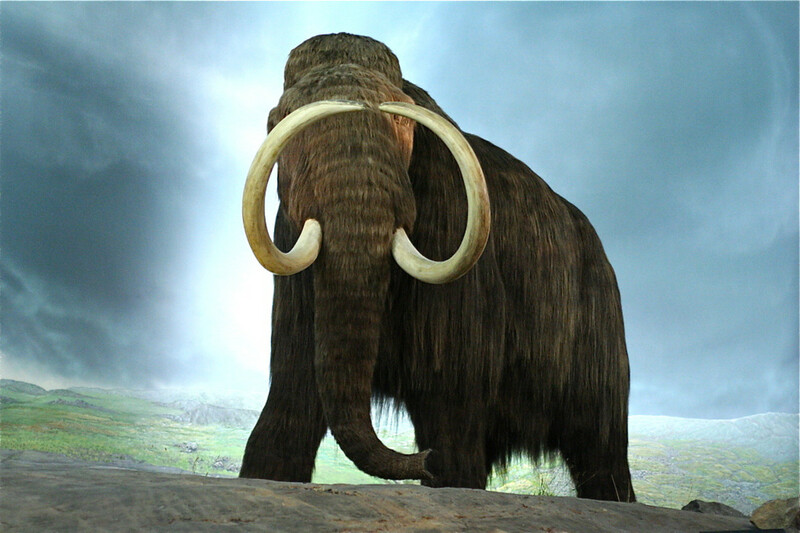 The idea of bringing an entire mammoth back into existence has excited many people. The excitement has intensified since a well-preserved female was discovered in Siberian permafrost in 2013. As scientists moved the mammoth, a dark liquid dripped out of her body, collecting in a cavity in the ice. This liquid was thought to be mammoth blood, although how it stayed in a liquid form for such a long time was and still is mysterious. In 2014, tests confirmed that the liquid was indeed mammoth blood. Most mammoths died out 10,000 years ago, although one population is believed to have survived until about 4,000 years ago. Researchers have found hemoglobin in the liquid coming from the mammoth's body but no intact blood cells. Like DNA, cells break down after death. The Siberian animal was a very significant discovery. Once she was transported to a laboratory, tissue samples were obtained from her body. The body was in excellent condition compared to other mammoth finds and yielded a lot of information. For example, the Siberian mammoth died about 40,000 years ago, was about fifty years old when she died, and produced at least eight calves. Partial strands of DNA were extracted from her cells. A large amount of DNA has been collected from the remains of other mammoths that died in very cold environments. There is talk of inserting mammoth DNA into an elephant egg and using an elephant as a surrogate mother. Could cloning a mammoth work? Possibly, say some scientists. A new word has been added to the scientific vocabulary. 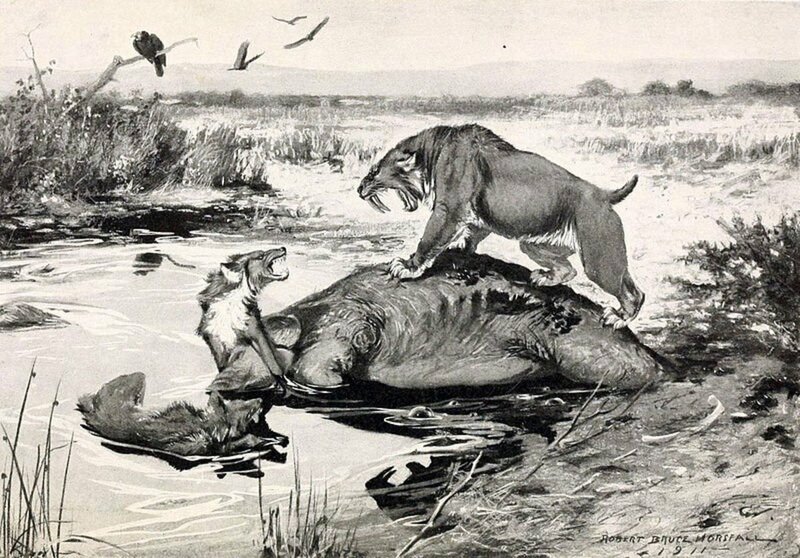 Bringing extinct animals back to life is known as "de-extinction". Some scientists are taking another approach to thIs process instead of transferring DNA. The result of their experiments would produce only partial de-extinction, however. The resulting organisms would have features of both modern organisms and extinct ones. The idea behind the process is to activate specific dormant genes in an organism. Some organisms contain genes that were functional in their distant ancestors but are no longer active. This is the case for chickens, which contain inactive genes for making a dinosaur-like snout and palate. (Birds evolved from dinosaurs.) In one experiment, researchers "turned off" the genes for making a beak in chicken embryos. As a result, the embryos produced a dinosaur snout and palate instead of a beak. The embryos were not allowed to complete their development, however. De-extinction is a fascinating but controversial topic, with many arguments both in support of the idea and against it. An organism is more than just its genetic code. Events and experiences as it interacts with its environment affect its behavior (and sometimes its genes as well). Extinct animals recreated today would lack their original environment, so would they really be the original animal? There are also concerns about how the recreated animals will affect ecosystems. Will they damage the environment or eliminate other species? Will they be doomed to a life of captivity? Will their existence be detrimental to humans? Some people feel that the money used for cloning experiments should be used to help solve social problems and help humans in need. The ethics of cloning bothers some people. They see genetic manipulation as a way of "playing God" and believe that we have no right to do this. Other people are afraid that cloning may be dangerous because we don't know enough about the consequences of manipulating DNA. The fact that multiple attempts at cloning are usually necessary in order to get success also upsets people. At the moment, many eggs and embryos die in the quest to create a cloned animal. In addition, some people worry about the effect of the embryo of an extinct animal on a surrogate mother. 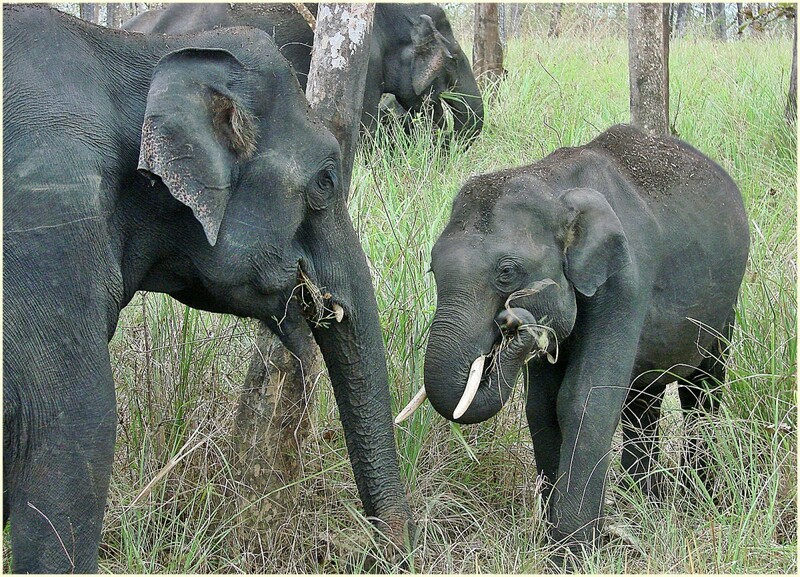 Forcing a modern elephant to produce a mammoth baby or a hybrid elephant-mammoth one could be viewed as cruel. It could also harm the elephant population, since the closest relative to the mammoth is believed to be the endangered Asian elephant. Can We Bring Mammoths Back to Life? In February 2017, a team of researchers from Harvard University claimed that the creation of a mammoth-elephant hybrid embryo was just two years away. They hope to eventually produce a baby in an artificial womb instead of subjecting an elephant to the pregnancy. The factor that spurs many researchers on is the sheer wonder of de-extinction. It would be awesome to discover the true appearance of an animal that we know from only a few bones and to observe the animal's behavior. By sparking the public's interest in extinct animals, scientists may also spark their interest in other animals on Earth. Many recent animal extinctions have been due to human activities, such as hunting and habitat destruction. Some people feel a sense of justice in the idea of bringing back a species that we destroyed. By studying and practicing cloning and genetic manipulation in the creation of extinct animals, scientists are discovering important information about DNA and genes and are learning new skills and techniques. Their knowledge will be useful in the study of human biology and the biology of animals that affect our lives directly, such as farm animals. It may even help scientists prevent and treat diseases. Bringing back specific animals may be beneficial in certain ecosystems. 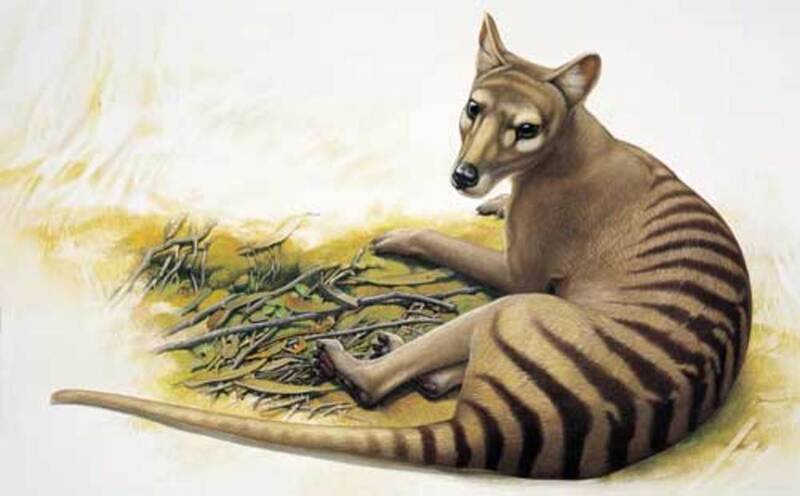 What is your opinion about bringing back extinct animals? It's a wonderful idea! I'm looking forward to seeing animals that have disappeared from the Earth. The idea is good, but only if humans and the earth remain safe when the extinct animals are created. The idea is good, but only with respect to bringing back certain animals. This should never be done! Zoos and other organizations are obtaining DNA from the animals in their care and preserving it. The good institutions are trying to breed endangered animals to prevent them from becoming extinct. If breeding efforts fail, however, the DNA may enable the species to be recreated in the future. De-extinction is the only way for us to see animals already lost from the Earth, but it's not an ideal situation and its success is uncertain. It's a much better tactic to protect species that are alive today than to try to resurrect them in the future. The decision about which animals would be good to bring back will be up to scientists. I mention some possibilities in the article. Scientists couldn't bring back dinosaurs at the moment because they haven't found any of their DNA. What are you bringing back? Cause some are good and some are bad for instance dinosaurs are very very very bad. The latest research exploring mammoth de-extinction is very interesting. what about the new researches of de-extinction, its very interesting and informative. good job Linda. Thank you for helping with my science assignment! Yes, I've always remembered this quote! It would be amazing to see ancient and extinct animals again. Thank you for the comment. Great hub. Its difficult to say what right and whats wrong, but it would be amazing to see real dinosaurs or mammoths in real life. We have to think about Ian Malcolms quote: Life will find a way. Thank you very much, Grayson. I'm glad the article helped you. Your work here has really helped me with my biology research paper. Thank you so much!!! Hi, Vellur. I agree - there is definitely lots to think about and explore. It's an interesting topic that could have major consequences. Thanks for the comment. An interesting and informative article about ways to bring back animals that have become extinct. But I wonder how this will work out in the future and how this will affect the animal kingdom. Lots to think about and explore. It does indeed! Thanks for the second comment, Robert. Interesting, it seems a brave new world is coming closer. Hi, Robert. We haven't yet brought extinct animals back into existence. There's been some interesting research done with chicken embryos, though. By activating certain genes, researchers have been able to get some chicken embryos to grow a dinosaur-like snout and others to grow legs that resemble those of dinosaurs. None of the embryos were allowed to complete their development, though. Thank you. This article does a good job of explaining the process and the techniques. How do these de-extinction cloning attempts compare with cloning living animals as far as success rate goes? Hi, Anthony Altorenna. I agree with you! Part of me is absolutely fascinated with the idea of seeing extinct animals - or their approximations - but there are so many worrying points about bringing the animals back to life. Thanks for the visit. As much as I'd like to see extinct animals roaming the planet again, re-creating a species from genetic material (cloning) is a slippery slope. Like the saying goes: "just because we can, doesn't mean we should". Hi, zoey24. Thank you very much for the comment and the vote. I think that all the points that you've raised are very valid. It's so tempting to see what animals in the past looked like, even if only approximately, but there are also many points to consider in relation to animal welfare. Fascinating hub. I have always been interested in Mammoths and although it would be interesting to see one in real life, I don't agree with cloning. I believe that these animals are extinct for a reason, and they would find it difficult to adapt to today's environment. I also feel that it is unfair to clone these animals just so they can be used as science experiments. Hi, Dolores. Yes, you've raised some very good points. There are so many living species of animals that are close to extinction and need our help. It seems a little strange to attempt to bring back already extinct animals instead of helping the current ones. 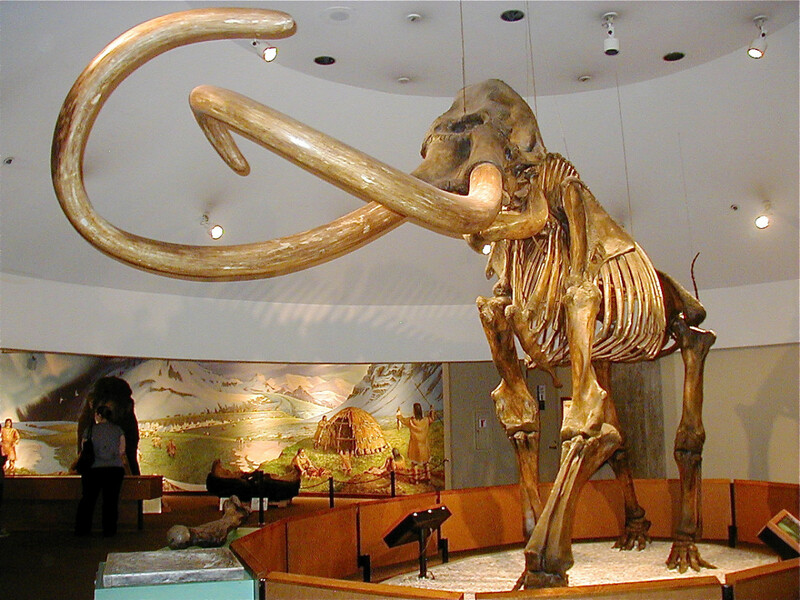 Bringing back a mammoth is a fascinating idea, though, even though it's so problematic! This was a great read and so informative! I've heard about the idea of cloning wooly mammoths and though the concept sounds romantic - I think of those awesome creatures roaming again just like in the video - I don't think it's a good idea. I imagine one lonely mammoth, brought back, and it seems so sad, pitiful even. Instead of trying to recreate something that's gone, the effort and money should go to saving the creatures that are now endangered. Hi, Alfred. Yes, the possibility of bringing back extinct animals is interesting. Thank you very much, Gardener Den! I appreciate your visit. I know what you mean about wanting to live as long as possible to see new technological wonders, howlermunkey! I feel the same way. Thanks for the visit. Soooo, there's some truth to Jurassic Park ey? (I miss Crichton). Id be equally impressed if they could bring back the 80's so I could wear my clothes again... Awesome article, its because of technological mysteries like this that I want to live as long as I can... I want to see how far we can go..... wooly mammoth someday? Would be awesome. Thank you very much for the comment, DDE! Bringing Back Extinct Animals - Cloning Research and Concerns great hub and so well presented, you certainly deserve this award. Thank you very much for the comment, Martie. I appreciate your visit, especially when you're so busy. Sometimes there don't seem to be enough hours in the day to do everything that we want to do! Very-very interesting! I agree with the concerns, but also with some of the benefits of de-extinction. The eye of my imagination can also see a horror-movie - the behaviour of animals and plants in a foreign habitat is unpredictable. Absolutely fascinating, Alicia. BTW, I have seen the most interesting hubs on your profile page. I am missing out on a lot of fascinating hubs due to my overloaded schedule! Thank you, Karmallama! I appreciate your comment and your vote very much. I love this hub! So much information, and very well put together. Great job! Voted up! Hi, Rolly. Yes, the appropriate use of technology is an important topic. There is the potential for harm as well as good in our technological discoveries. Drumheller is a very interesting place. I've been there once and would love to return! Thank you very much, Ireno Alcala!! I appreciate your comment and your vote a great deal. Just like in the movie "Jurrasic Park", it is now being realized. Thanks for this update. I voted this article as an All-Around Hub for 2013. Thanks for the interesting comment and the vote, Tom. Cloning is a fascinating topic, but its regulation is important, as you say. Interesting and thought provoking hub! You have to love science - for everything it has given the human and race. As for me, regardless of the hypothetical what-ifs, ethical, and moral arguments I think genetic cloning is a something that should be explored. The question is how to regulate the process. Who decides what is acceptable criteria/subject matter? Voted up! Thank you for the congratulations, Happyboomernurse. "Toddlers playing with fire" is a great description! We certainly do have a lot to learn about the ways in which cells and genes operate. It would be wonderful if researchers could learn more about how to help medical problems as they explore cloning. Congrats on earning HOTD for this well written and fascinating hub. I like the fact that you included the pros, cons and some of the potential risks and ethical issues of cloning extinct animals. My personal opinion is that at present, the risks seem to outweigh the positives. With our current knowledge and skill level we are like toddlers playing with fire, yet as we learn from experience and experimentation there is increased potential to harness and master genetic cloning for medical and social good. Thanks for the votes and the congratulations, Heidi! Yes, there is a lot to think about before bringing back extinct animals, not only with respect to the ways in which the animals might affect the earth but also with respect to the life that they will experience. The concept of creating a Jurassic Park type scenario is both intriguing and disturbing. On one hand, I'd love to see a real dinosaur or mammoth. But what life would it be for them? Voted up and interesting! And big congrats on Hub of the Day! Thank you for the visit and for all the votes, tillsontitan! I appreciate your comment very much. Its a good thing i always read comments before me because PegCole said exactly what I was thinking...Jurassic Park! That's the first thing that came to my mind. How do we control that which we do not know? Your hub, however, is so well written explaining a subject that many are hearing about but know nothing about. Certainly deserving of HOTD! I agree - the effort to bring back extinct animals could have good or bad effects on our world. Thank you very much for the comment, pstraubie48. I appreciate the angels, too! Very interesting and thought provoking hub you have written. If only good could come of this it would be a lovely thing.. Somehow things such as this that have possibilities to be very helpful, sometimes being not so. Thank you for sharing this with us. Thank you very much for the comment and the congratulations, Peg! It is interesting how fiction sometimes becomes fact. Future developments could be fascinating! Hi AliciaC, Congratulations on another HOTD award. You rock. As far as cloning and reviving extinct animals, I'm reminded of the movie Jurassic Park where the dinosaurs were brought back to life and the disastrous results of that experiment. Funny how life sometimes imitates fiction or is inspired by it. Hi. Jeffrey. Yes, there could be all sorts of repercussions if extinct animals were brought back. The idea of seeing the living animals is so exciting, though! Thanks for the comment. This is a very interesting hub. It really makes me think. I would love to see some extinct animals brought back, but they also died for a reason and something came of that. If they are brought back will that throw a wrench in the animal kingdom's structure? Hi, Nell. There is certainly a lot to think about in relation to de-extinction! Thanks for the visit and comment. Hi Alicia, this is a fascinating subject and you explained it really well, I tend to think that it's a brilliant idea, then I get to thinking about the eco system, the fact that these animals died out for a reason and so on. And now I have talked myself out of it, in theory its fascinating, practically, not so good. I certainly hope not, Resident Weevil! Thanks for the visit. I'm surprised no one else has broached the subject, so I guess I'll be the first to ask: Does this mean Samuel L. Jackson is in imminent danger of being dismembered by a velociraptor? Thank you for the comment, ignugent17. I appreciate it! Very interesting hub. I am not sure if I will be happy if they are back :-). But great information thanks. Hi, Elias. Yes, other people have wondered why we are trying to bring back extinct animals instead of doing more to protect living animals that are in danger of becoming extinct. Thanks for the visit and the comment! Yes Deb, extinct animals brought back to life could certainly create havoc! The process would have to be done very carefully. It would be wonderful if the research leads to medical advances, though. Thanks for the votes! I think that our priority should be to protect endangered animals by allowing them to inhabit their natural environment and take strict measures against environmental pollution. I think that cloning raises important ethical questions that first should be addressed while it would also be a major intervention to nature with probably unknown results. Interesting and informative hub, Alicia! The idea is tantalizing and could mean a great deal to research, BUT what would a wooly mammoth do in today's world? It could cause the extinction of other animals, so this must be very carefully brought to fruition. I would hate to see what havoc this could raise. HOWEVER, with stem cells and other dramatic anomalies, it certainly has its place in eradicating undesirable human traits. Awesome and up! Thank you so much for all the votes, thelyricwriter! I appreciate your comment. Bringing back extinct animals and cloning are exciting ideas. It will be interesting to see how the technology and the debates about its appropriateness progress! Hi, Pamela. Yes, that is a worry about cloning. We may have laws about what can be done in our country, but other countries may not have the same laws. Thank you very much for the vote and the share. Alicia, voted up, useful, awesome, and interesting. This is a very exciting article and topic. I'm all for this, imagine the advancements in technology that it would bring. I see nothing wrong with it as long as it isn't abused. Fascinating article Alicia. You did such an excellent job of fully explaining cloning and how DNA works. While there have been some marvelous discoveries to help fight some hossible diseases, the idea of cloning extinct animal is not something that I think is a good idea. I think it is a dangerous path. The outcome of what other countries and ours might do is unknown, and I think it is quite unpredictable. Awesome hub, up and shared. Thanks for the comment and for raising some very good points, JPB0756! Use this funding to clone human appendages; something USEFUL. Who needs more, and substantially larger mouths to become part of an established, evolved ecosystem? Genetic knowledge is for us, not anomalies. Hi, drbj. Yes, de-extinction is a fascinating topic. I agree, though - we will have to be very careful about choosing the animals that we try to bring back! The ideas of cloning and bringing back extinct animals sometimes have that effect on people, Bill! They are fascinating topics with many implications. Thanks for the visit and the comment. Hi, Faith. Dilemmas such as the ones that you've mentioned will likely increase in number as technology advances! You are so right - our grandchildren will almost certainly see things in their lives which we cannot comprehend at the moment. I think that all the research is fascinating, but the potential problems worry me as well. Thank you very much for the visit. I hope that you have a great day, too, Faith. Alicia, I don't know exactly why cloning bothers me but it does bother me, and the idea of bringing back extinct animals, although fascinating, still bothers me greatly. Maybe I'll be able to figure out why at some point. Anyway, interesting subject and well-written as always. What a fascinating hub here. Excellent write and does bring to mind much concern though, such as you have indicated here. The unknown as to how such animal will live in this world today and plus with the manipulation of the DNA, is very concerning. Then there will be the cloning of humans, which that person will not be that same person, but an individual, which some may think they can bring back their mother, but that person really would not be their mother but another person. I just do not think we have any business playing God, but I can see the other side of it too. Thanks for the comment and for sharing your opinion, MG Singh. Hi, The Touch Typist. Yes, there are all sorts of consequences of this technology. Living animals have already been cloned, so the possibility of cloning a human is already present. But what about the ethical implications of cloning? If they can clone a wooly mammoth, how long will it take before cloning human beings? Thank you very much, jainismus. I appreciate your comment, as well as the share. Thank you for sharing this well explained and detailed information. Share with my Hub followers.